Yesterday, a federal judge revoked the $5 million bail of Martin Shkreli, the infamous pharma bro. This means he is definitely going to jail while he awaits sentencing for securities fraud. The Internet, unsurprisingly, is engulfed in a paroxysm of schadenfreude. Shkreli is an easy man to hate. 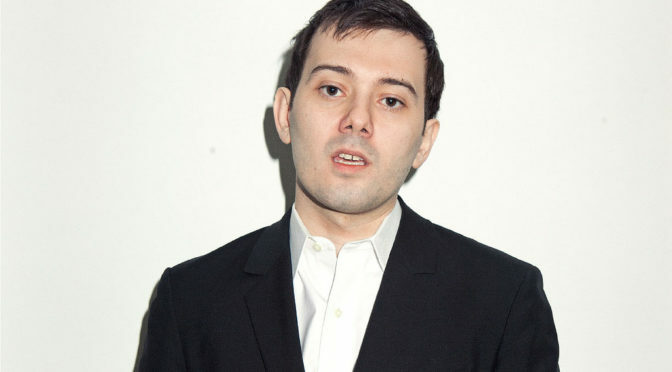 Whether he’s offering thousands of dollars to anyone who pulls Hillary Clinton’s hair out or “disrespecting the Wu-Tang Clan,” Martin Shkreli is easily the most hated man in America. And you know what? I couldn’t possibly care less. Daraprim still costs $750 per pill. Nothing has changed for me or anyone else who needs Daraprim. Nothing that happens to Martin Shkreli will change that. Daraprim, often inaccurately referred to as an “AIDS drug” in media coverage, treats acute toxoplasmosis infection. Toxoplasmosis can cause brain, eye, and lung damage in fetuses and people with weakened immune systems. I contracted toxoplasmosis before I was born. As a result, I am partially blind. I have had to take Daraprim before, and I may need to again. On top of that, given Congressional Republicans’ seemingly endless efforts to repeal the ACA, I am increasingly uncertain if my insurance will pay for it next time. Martin Shkreli isn’t even being charged with hiking the cost of Daraprim 5000% (yes, all of those zeroes are supposed to be there). He’s being charged with lying to investors. Everything Martin Shkreli did with Daraprim was legal. Two years later, everything Martin Shkreli did with Daraprim is still legal. There is still no federal law against anyone else doing exactly what Shkreli did. In fact, it’s happened several times since then. I said this two years ago, and I still believe it: Martin Shkreli doesn’t matter. Shkreli is a fool, not a super villain. Whatever disgusting antics Shkreli indulges in next don’t matter. Whatever consequences Shkreli faces for being the most hated man in America don’t matter. It is easy to feel pleasure in Shkreli’s misfortune. However, hating him changes nothing for me or anyone else who needs Daraprim. There are still thousands of Americans with rare diseases who rely on exorbitantly expensive treatments to live. Ignore Martin Shkreli. Instead, call Congress about drug prices.